Fig. 5.122 Three equilibriums for a two-box model of Stommel (1961): the stable note (indicated by a), the saddle (indicated by b), and the stable spiral (indicated by c); the arrows indicate the behavior of the model's solutions in the T-S diagram. density difference due to the temperature component. Such a large salinity difference is possible for a slow circulation only because of the long relaxation time scale. • An unstable state that is thermally controlled, represented by the saddle point b in Figure 5.122. Three-box model by Rooth (1982) Stommel's idealized two-box model unfortunately went unnoticed for 20 years after its publication. The potential role of wind stress in the thermohaline circulation was also investigated by Stommel and Rooth (1968) in a similar two-box model; however, the role of wind stress was again overlooked for an even longer time. In fact, this paper has seldom been cited to date. Like many of the simple models postulated by Stommel, this two-box model seemed so completely different from the real world that for a long time nobody paid much attention to such an apparently simple model. Stommel's original model is formulated for the thermohaline circulation in a single hemisphere, i.e., between the equator and high latitudes. Rooth (1982) made the second step by formulating a three-box model for the thermohaline circulation (Fig. 5.123), which consists of one equatorial box and two hemisphere boxes. The system possesses four possible modes, including two symmetric modes and two asymmetric modes (Fig. 5.124). The two symmetric modes include: one mode with upwelling in the equatorial box and sinking at high-latitude boxes (top row), so that this mode is composed of two thermal modes in both hemispheres; another mode consists of upwelling in high-latitude boxes and sinking in the equatorial box (second row), so this mode is composed of two haline modes in both hemispheres. Fig. 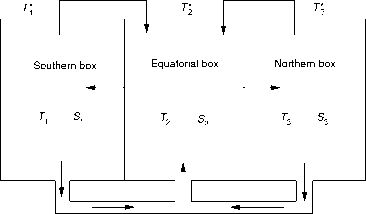 5.123 A three-box model for a two-hemisphere ocean, where the temperature in each box is maintained by a hot/cold bath of T*, and two ion pumps move salt from two side boxes into the central box. Fig. 5.124 Three-box model for a two-hemisphere ocean. The two asymmetric modes consist of a thermal mode in one hemisphere and a haline mode in the other hemisphere, and these can be called pole-to-pole modes, as shown in the third and fourth rows in Figure 5.124. An important postulation made by Rooth is that a symmetric solution might be unstable and could drift toward a pole-to-pole mode. Such a drift may cause a dramatic change in the oceanic circulation and the climate of the Earth. Therefore, Stommel's (1961) pioneer work laid down the foundations for revealing multiple states for the thermohaline circulation; however, his work did not explore the transition between the thermal mode and the haline mode. Rooth's (1982) work set out the possibility of a transition in the state of the thermohaline circulation. The potential abrupt changes in thermohaline circulation or the so-called "thermohaline catastrophe" finally emerged in the 1980s, becoming one of the most exciting research frontiers for oceanic general circulation and climate. Instability of the symmetric thermal modes A more accurate study about the instability associated with the symmetric mode was carried out by Walin (1985). Assume that the surface thermohaline forcing, including both thermal forcing and freshwater forcing, is symmetric with respect to the equator (Fig. 5.125). The initial steady state of the thermohaline circulation is symmetric with respect to the equator, with sinking at high latitudes due to strong cooling and upwelling in the equatorial band (Fig. 5.125). Fig. 5.125 Thermohaline circulation in a two-hemisphere basin (modified from Walin, 1985). If RP = "pTl-S) < 2, a perturbation to the saline component parasitic to the thermal mode is unstable and will grow. Since the total amount of salt in the ocean is constant, salinity perturbations in the two hemispheres must have opposite signs. 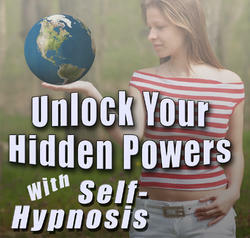 As a result, the system evolves in the following way. First, the thermohaline circulation becomes asymmetric with respect to the equator, and there is cross-equator flow of the thermohaline circulation, i.e., the pole-pole mode grows as the result of this instability. In fact, the meridional circulation in both the Atlantic and Pacific Oceans includes a strong component in the pole-pole mode. Second, the density ratio, Rp, is driven toward a value greater than 2. 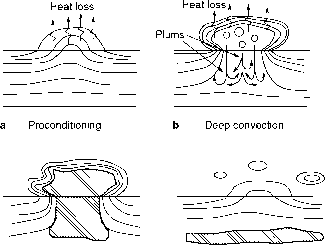 Note that Stommel (1993) proposed a salt regulator theory of the oceanic mixed layer. According to his theory, owing to the stochastic forcing by rainstorms, the density ratio in the ocean is driven toward a value of 2.
where APa is the unknown atmospheric pressure difference, which can be eliminated using the continuity equation.